Hi!... I'm a Big Horn Sheep and I'm famous for my magnificently curling huge horns. Do you know that they can weigh up to 30 pounds? I spend most of my days grazing on grass, leaves, herbs, twigs and shoots. You will find me in the Rocky Mountains, and my split hooves and rough hoof bottoms, along with my keen eyesight, all help me to move nimbly and easily about the mountains that are my home. 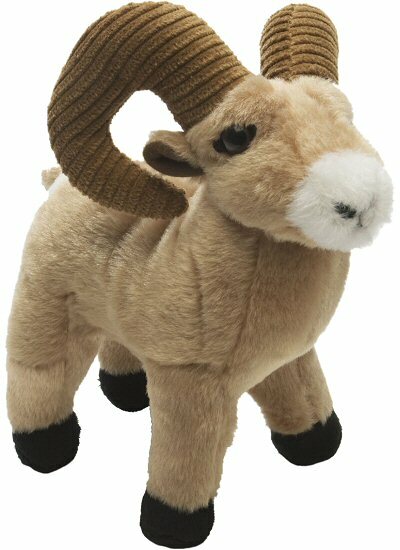 A portion of the proceeds from the sale of this fun Mini Cuddlekins stuffed big horn sheep helps to provide housing and education for disadvantaged children, as well as protection for abandoned animals throughout the world.